 Family therapist Weingarten digs beneath society's expectations and its image of the perfect mother to examine the question of how a woman can be a parent and still retain her individual ``voice,'' speaking and evolving as the person she really is. When Weingarten developed breast cancer in 1989, the radiation unit became a caring environment in which, however, she could not express many of her feelings and fears regarding the cancer. 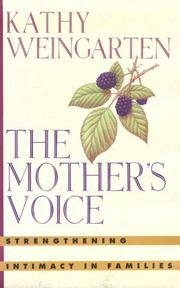 In her book, she uses this experience as a paradigm for the situation in which many women, as mothers, find themselves. She analyzes the problem of the working mother, the changing role of the father, and especially the mother's need to share herself with her spouse and children and to tell her own story. Our culture, she notes, insists on the mother's ultimate responsibility for her children's fate; Weingarten, however, presents the mother as less powerful, preferring to speak of the ``judicious'' responsibility of other family members and even of society. She writes that when she told her two-year-old son, ``Mommy's sad,'' she enabled him to develop his capacity to empathize and nourish. Weingarten is conscious that she has been influenced by the feminist perspective of the '70s and '80s, and this becomes apparent in her tendency to see family relationships in terms of negative stereotypes. She too easily dismisses Robert Bly's emphasis on the adolescent boy's need to separate from his mother as merely the result of a static view of the maternal role, and she fails to spell out the implications of her argument that society should take on more of the responsibility of parenting. Still, an outspoken and highly personal account of the difficult task of being a mother.